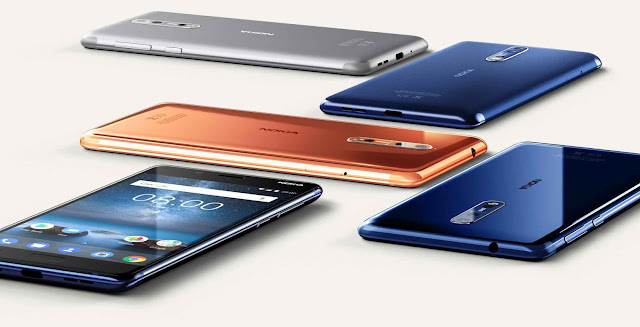 Nokia 8 is officially launched by HMD Global with a series of features such as Dual 13 MP Carl Zeiss Cameras at back and also a 13 MP Carl Zeiss Front Camera which states that Nokia 8 will be the game changer again in the mobile photography world and that too at a price tag of EUR 599 (approx Rs. 45,000) and it will also Splash-proof. Nokia 8 boasts a Qualcomm Snapdragon 835 Octa core, (4x2.5GHz Qualcomm® Kryo™ CPU + 4x 1.8GHz Kryo) Processor which is the latest available. It is configured with 4GB DDR4 RAM for smooth Lag Free Usage. Nokia a packs a 5.30-inch QHD Display with a screen resolution of 2560 x 1440 along with 2.5D Curved Corning Gorilla Glass 5. 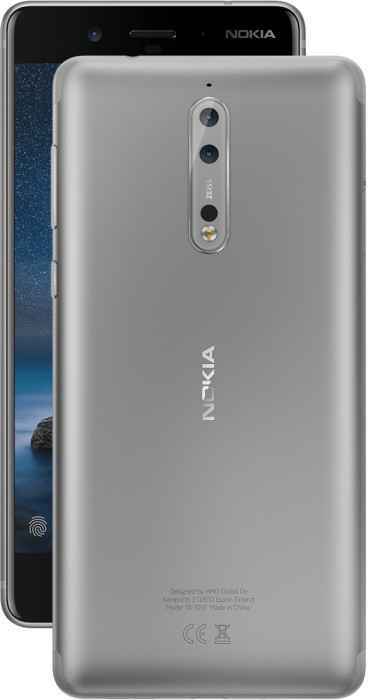 Nokia 8 packs 13 MP Dual Rear Camera with Carl Zeiss Optics and dual tone flash along with a 13 MP Front Facing Camera also with Carl Zeiss Optics. Both Front and Back Camera Use Laser autofocus & are configured with PDAF with the front camera having a display flash.It also packs a Feature said to be as Share Both Side Stories which allows you to use front and rear cameras simultaneously. Nokia 8 comes with 64 GB Onboard storage configured with 4 Gigs of RAM, But the Glossy Blue Variant will be available with 128 GB onboard Storage. Nokia 8 packs a 3090mAh2 NON-Removable Battery which is said to give a 24-hour backup even on heavy usage as the processor is said to be very much power efficient.